When it comes to thinking outside the box, up might be the way to go. Not only is a living or preserved plant wall perfect for limited space, there are numerous other benefits that you probably never realized. Let's start with a living plant wall. What is a Vertical Living Wall? Imagine a vine covered Victorian mansion. In a sense, that was one of the very first “living walls.” These days, a modern living wall consists of a team of designers who not only create a growing, breathing piece of art, but a self-sustaining, irrigated system of plants specific to your aesthetics and needs. Beginning in the 1980's, the living wall has continued to gain momentum and will be the future of sustainable cities. ALL of that from planting outside the box onto the wall – Not to mention, they're beautiful. What is a Preserved Wall? 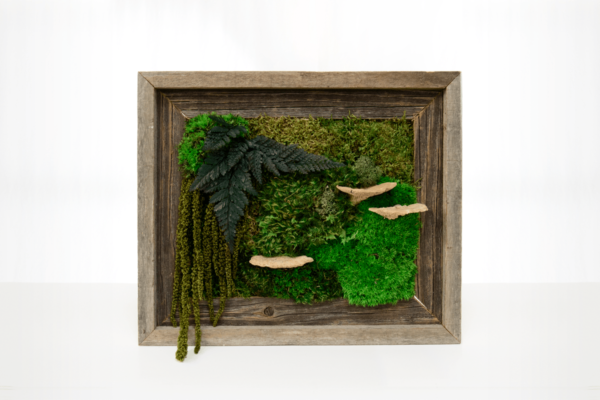 A preserved vertical wall usually consists of dried mosses, ferns, mushrooms, driftwood, grasses, flowers, and various other plants. …IT'S THE PERFECT BLEND OF NATURE, ART, AND SUSTAINABILITY.